As a group, we have many different things that annoy each and every one of us on a daily basis and the diversity of our jobs gives us lots of content for writing as the AL. One of the team will start a post, then the rest of us will add a paragraph or two (that is why all AL posts are so long — a large blog team means long posts when you write round robin). Now that we have outed ourselves, however, we fear that it will not be as fun for others to read AL — after all, half the fun is trying to figure out who is behind the pseudonym. Entry filed under: Uncategorized. 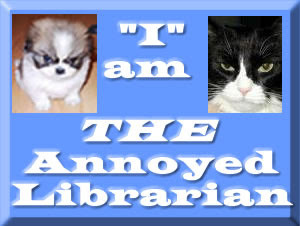 Tags: annoyedlibrarian.